Suite A - 2,400 sf: Lobby, reception, 2 restrooms, 3 exam rooms, private office, breakroom and open area in the back for storage or expansion. Notes: This building has a long time restaurant tenant, Kiro Shima on 1st floor Lease has been renewed for 5 additional years. Upstairs has separate entry way and is ideal for (retail, art gallery or office). Located 1 block from Georgia College & State University and centered in the busy area of retail & restaurants. Neighbors: GCSU, Baldwin Co. Courthouse, The Brick, Verizon, Buffingtons, The Velvet Elvis, and The Exchange Bank. Notes: Located less than 2 minutes (.66 miles) from Oconee Regional Hospital. Convenient to downtown and Highway 441. The brick building has a lobby with a restroom, reception area, 3 or 4 treatment rooms, 2 patient restrooms, private office with restroom, breakroom, lab and nurses station/work area. 2nd floor, 476 sf, completely finished with heat & air. Ideal for storage, another office, work out area for staff, lots of attic space. Convenient to Navicent Baldwin Hospital, downtown Milledgeville, and the Hwy 441 retail corridor. Property is located at the corner lot of Irwinton Rd and Thomas Field Rd. It is .100 yards from the Central Shop Entrance at Central State Hospital. Ideal location for convenience store, retail store, laundromat or multi-family. There are several structures on the property including a 2,000 sf house built in the 1900’s, shed and mobile home. Highest and best use is to be redeveloped. Notes: Neighbors include: Walmart, IHOP, Chili’s, Mellow Mushroom, RFCU, Dollar Tree, Milledgeville Mall, Office Max, TJ Maxx, LongHorn Steak House, Lowe’s, and many other restaurants, banks and commercial businesses. 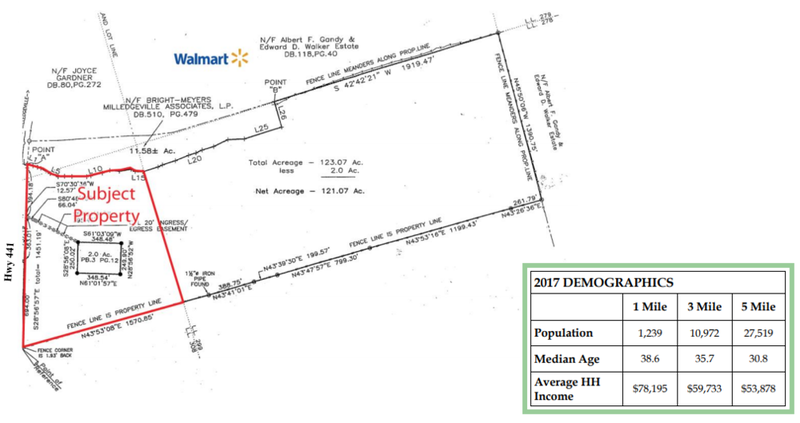 * There is additional land available behind this 30 acre tract. Ideal area for apartments. Contact agent for details. Ideal location for Truck Stop, Retail, Convenience Store, Student Housing, Industrial Sales or Storage Facility. Owner will consider dividing parcel. Located at signaled intersection and at the corner of Georgia's newest Mega Industrial Park.